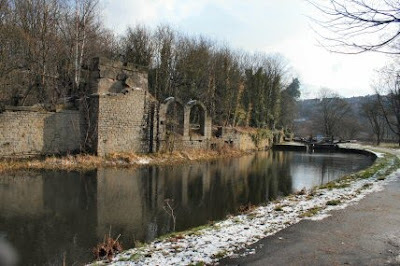 Capt Ahab said to keep an eye open for the old mill at Woodside Mills lock and here it is. As Capt said it does look rather Roman in style. Bright sunny weather to start the trip to Sowerby. 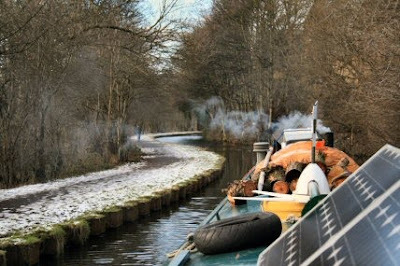 The canal becomes rather narrow and winding through the trees makes a restful trip. Its lovely along here in the summer and there are no other boats around today. There are some nice bridges and this is one of the impressive ones we went under. 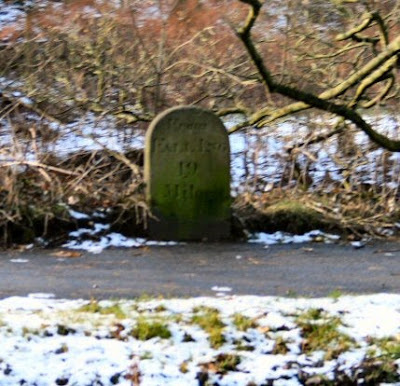 I found a milepost as we cruised. This one says that we are 19 miles from Fall Ing Lock. There have been several listing the distance from Fall Ing as we came along. 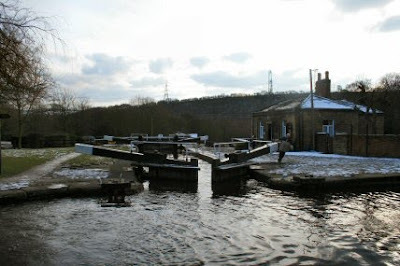 We soon came to the entrance to Salterhebble locks. The guillotine lock which is the first of three can just be seen over the top of the bridge. 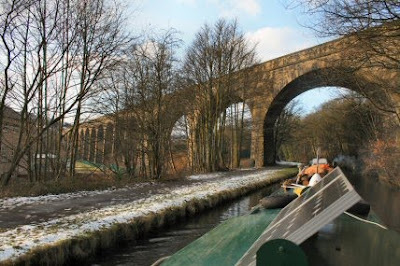 Over the top of Tims boat can be seen the separate tunnel for the towpath and access to the controls. The centre lock is bit of a problem for by the time I am out of the lock there is little room for turning to line up for the last one. There is only a couple of inches to spare once I am in the lock. 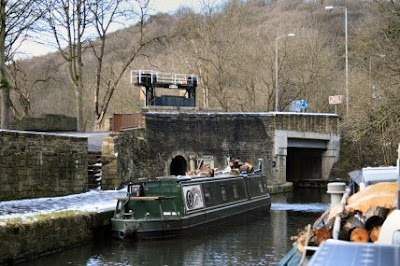 Leaving the top lock. There was even less room to spare here. 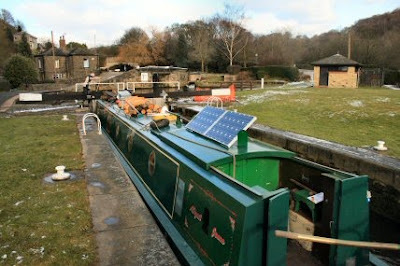 I had just one inch to get past that lock gate with the bows in the centre of the lock. Once out it is a 90 degree turn at the T junction. 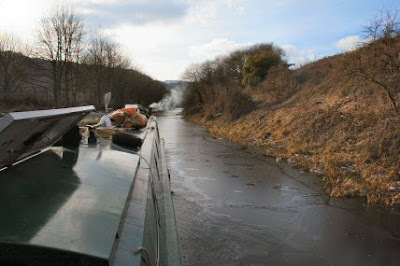 Almost as soon as we left Salterhebble locks we ran into ice. It was not very thick but it was enough to throw the bows off line. Most of the paint on the water line has gone by now. 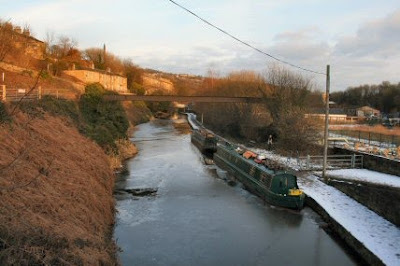 There was ice all the way to Sowerby Bridge. I had trouble getting alongside and had to break the ice and move it astern to tie up. 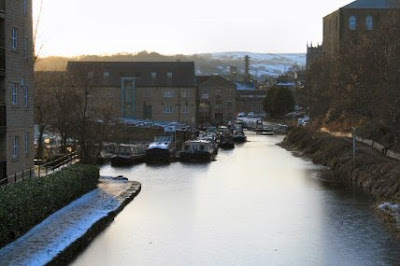 The marina at Sowerby Bridge from the bridge at the mooring. We will be staying here a while to look around and hope that the ice will vanish.